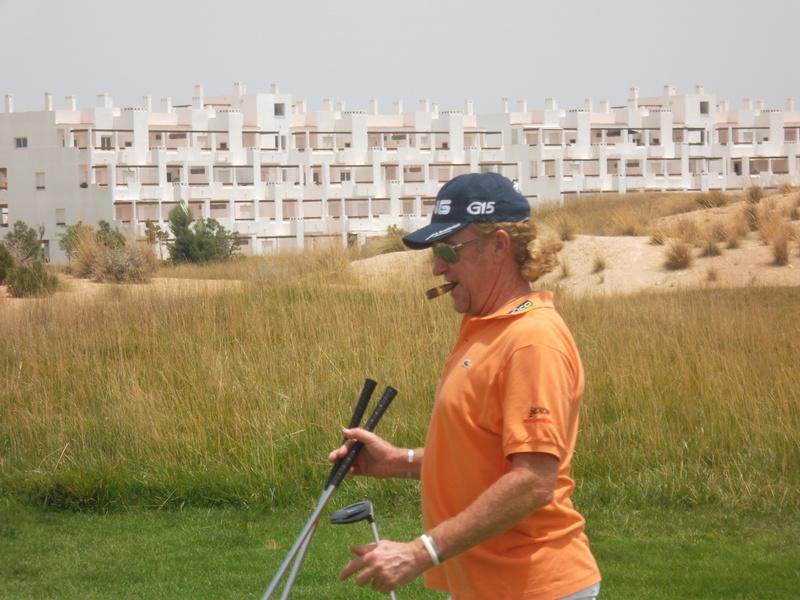 This week our fantastic course was visited by Ryder Cup player Miguel Angel Jiminez. Word soon got round that he was on the course, and he chatted to spectators and signed balls, caps, and shirts. It was surprising to note that he has quite spindly legs and so white – he always plays in trousers on the tour but let his legs catch a few murcian rays this week. It was amazing to see the distance he hits the ball without any apparent effort. He is almost due to join the seniors tour (49 in January) but still features near the top of the leader board in every tournament he enters. 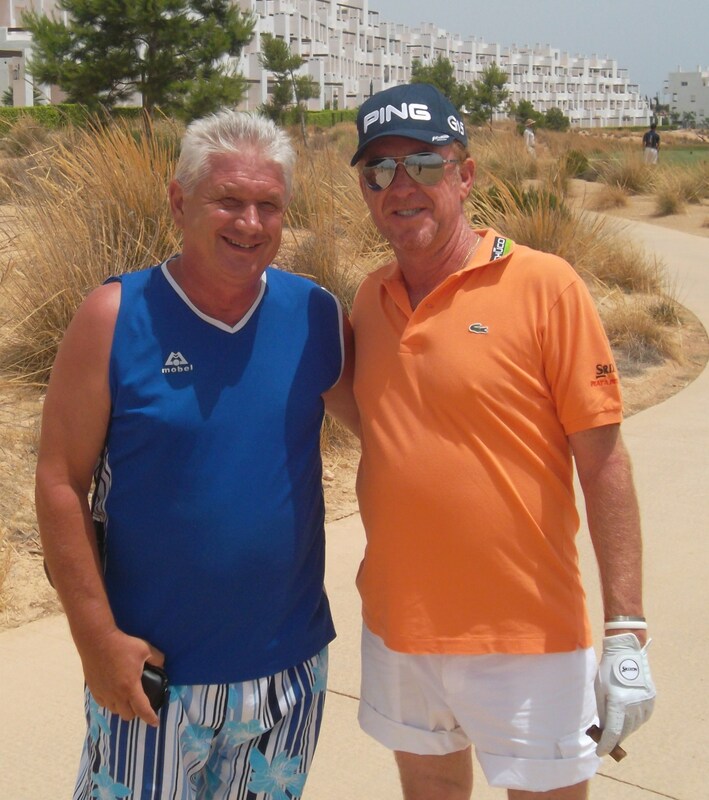 He is a veteran of 4 Ryder Cup teams and has won 18 times on the european tour. Still around number 50 in the world he was at one point inside the top 20. 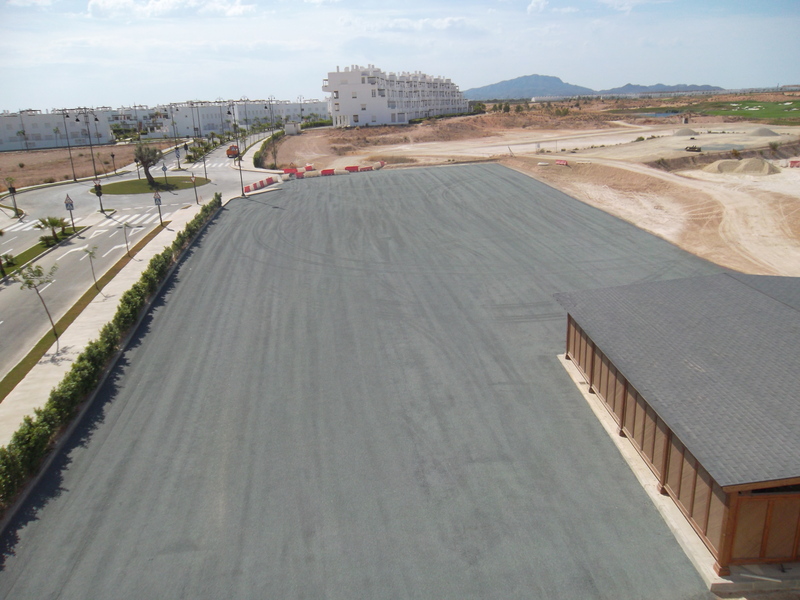 By all accounts he was impressed with Condado de Alhama so lets hope he spreads the word. Miguel missed the 11th green but chipped to 5 feet and rolled the putt in………………….. The famous bullfighter (senor Lopez?) was Miguel’s opponent in the 4 ball and he had a 2 on the 11th. 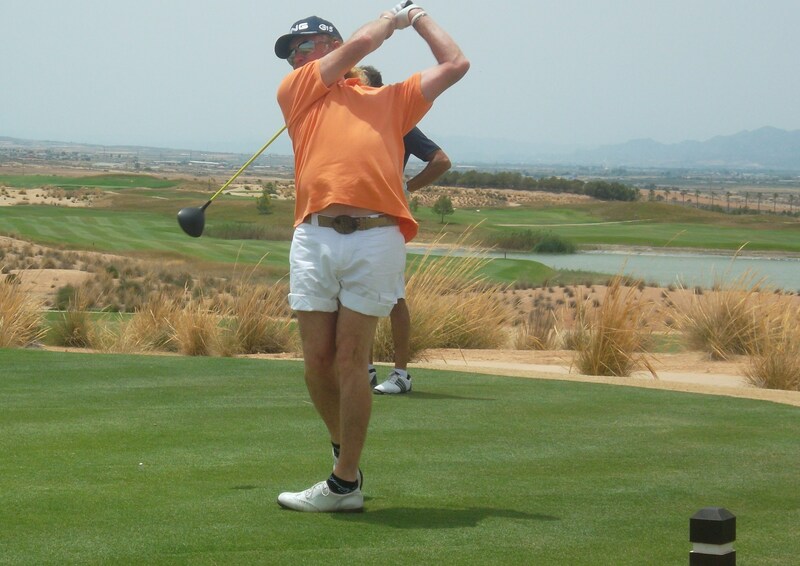 A full swing and perfect finish on the 12 tee…………….. I couldn’t refuse when he asked for a picture with me……………. I think he preferred Alicia though……………………..
A familiar sight of cigar in mid-air until the necessary shot has been taken……………………. It looks like it will be a good sized terrace area………………………. 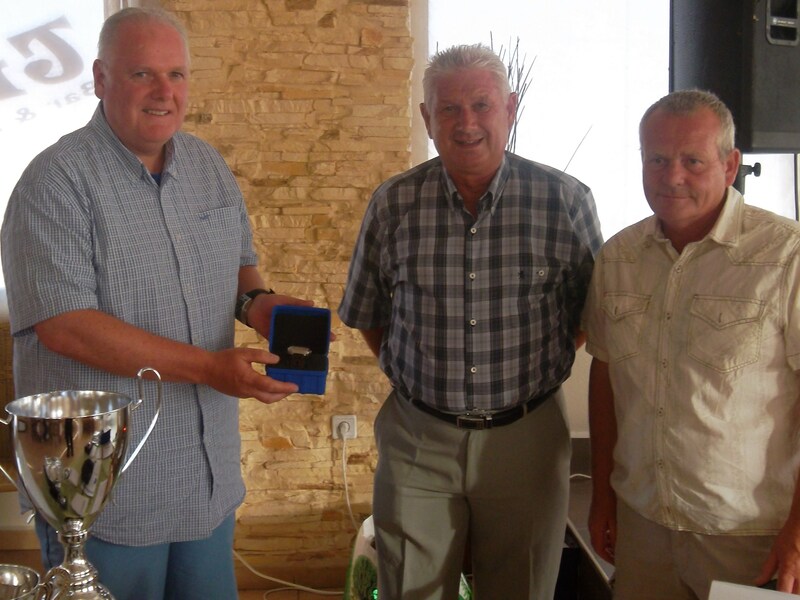 This week was the monthly Apollo Air sponsored stableford competition. I think perhaps today was the hottest Friday golf we have had this year, even with the breeze which got up later. 40 players entered and everyone of them turned up. Only one player managed to beat 36pts. Next week is a pairs stableford competition. In response to a request from one of our members the Friday start sheet for next week will be posted in the golf shop before play each Friday so players can put down for the following week as they pay their green fee. Twilight prices have been available all summer from 2pm for 35 euros. A new offer is now available for midday madness – between 12pm and 2pm it is only 30 euros to get fried! 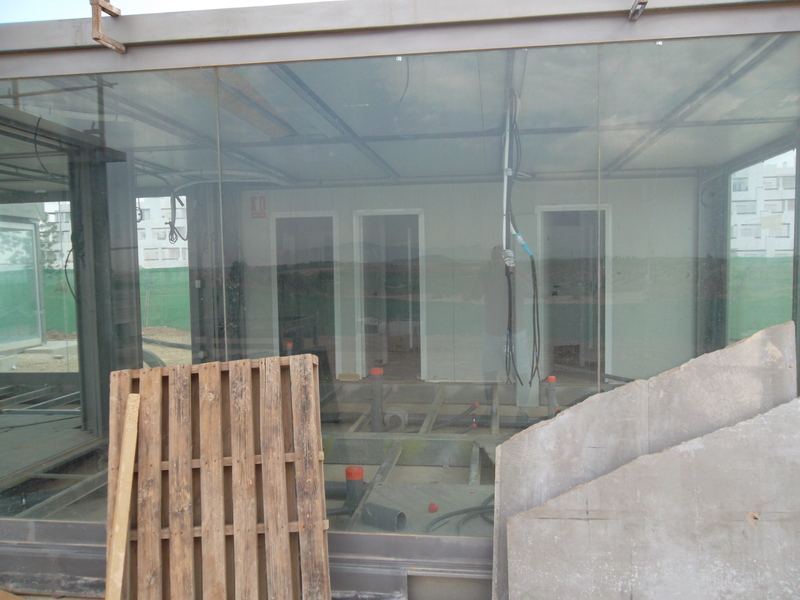 There is still a lot of work to be done on the temporary clubhouse. Most of this weeks work seems to have been done outside, levelling the terrace area and building a retaining stone wall. Surrounded by plants it shouls look really nice. 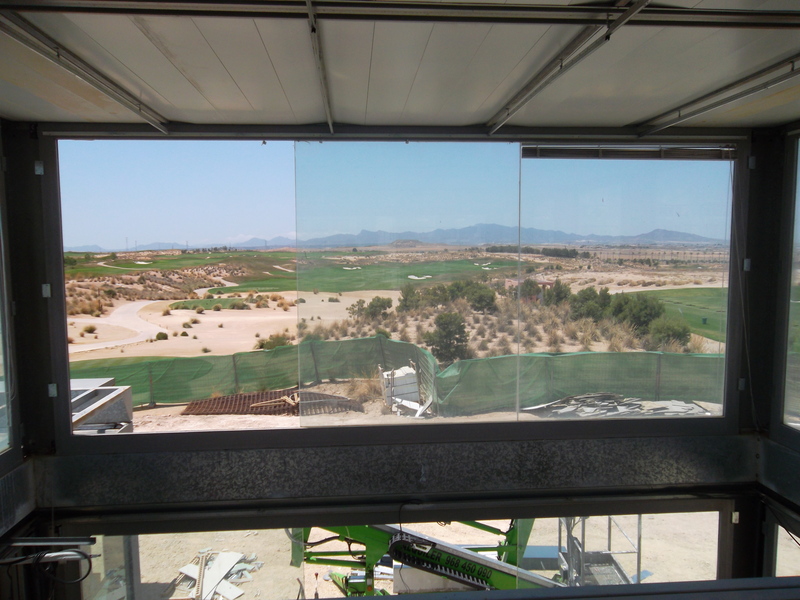 From the top viewing terrace you will be able to see the 18th green (with binoculars!) but not the 9th green. 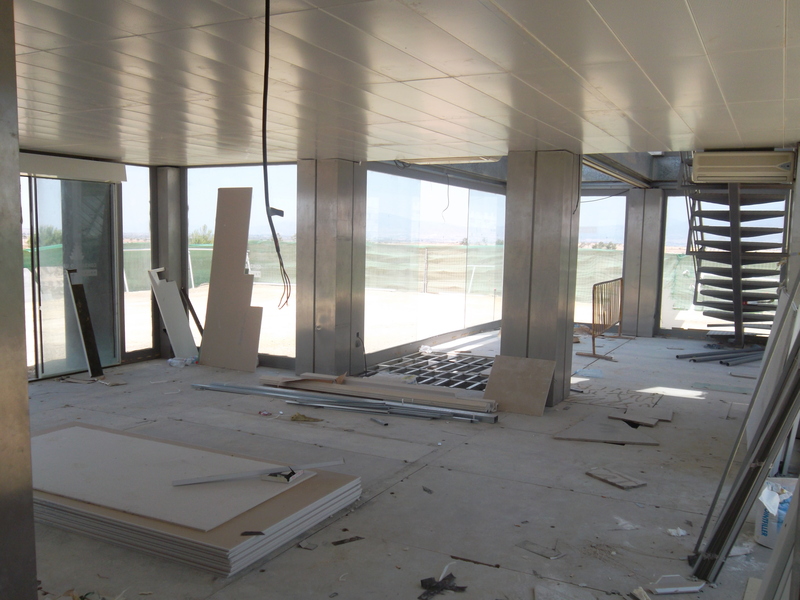 Ceiling and aircon units fitted in the entrance area……………. The car park is now in use…………………. There will be a Ryder Cup style competition at Aguilon golf later in the year. It sounds like a really good deal so please take asdvantage of it if you are here on the below dates. Cost is to be confirmed but will again be in the region of €30 to include 2 days golf with buggy, commemorative Team Shirt, meal & refresehments afterwards. Each team will consist of 32 players, and the UK team will be the top 24 players from the 3 qualifying competitions, plus 8 wild cards. The 3 qualifiers offer you the chance to play Aguilon at a really keen price (to play in 1 will cost €25, 2 will cost €40 & 3 just €55, all including buggy), and each competion will be a straightforward stableford off full slope adjustd handicap. To play in any (or all) of these all you need to do is let me know by e-mail which dates you would like to play, and I will send out a start sheet about a week beforehand showing your tee time & draw. You pay your green fee including buggy (€25 for your first event,€15 for your second &/or third one) on arrival at the course. NB If anybody just wants wants to use this deal to play Aguilon at a really keen price but does not neccessarily want to play the actual Ryder Cup, that is absolutely fine ! Thw white paint certainly makes a difference……………. I had to go back to the UK on Thursday (only until Friday) but that was enough. Nearly missed flight back due to torrential rain, thunder & lightning, spray, roadworks, diversions etc. 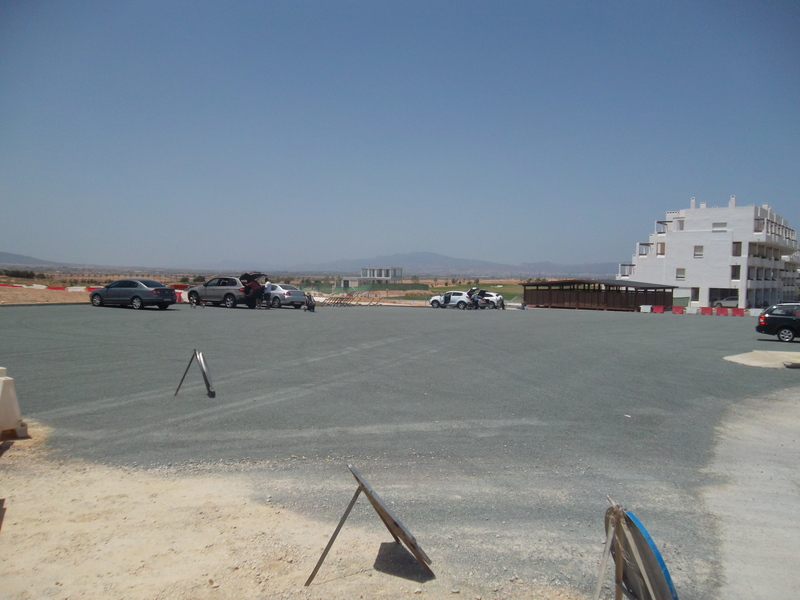 Every road was busy – what a relief to land at San Javier in beautiful sunshine and drive leisurely back to Condado with no one else on the road! In contrast, on Friday 29 players took part in a 4 person texas scramble in sunshine and with no wind. Unfortunately some teams were short with wrong tee times, illness & players failing to show. Nevertheless, it is unlikely anyone would have matched the winning score of 59.9. John Pitman again provided amusement on the course. His usual party trick is to disappear down the bank into the lake, but due to lack of water he tried something else. He didn’t waste any time providing entertainment with his first shot. His tee shot on the 1st hole hit the blue block in front of him, hit him on the ankle (2 shot penalty), flew past Mick Parson’s head and landed on the practice putting green. I think that Jack Nicklaus forgot to put an out of bounds marker behind the tee. Fortunately in a scramble you have 3 other drives you can use so the miscued shot was not expensive. No one feels safe when John hits his shot no matter where they are stood! Next week is the monthly Apollo Air individual stableford. Just a reminder to everyone that entries are onle accepted up until 8pm on wednesdays. Aftere that time it is at the discretion of the competitions committee. It may be that entries will be taken if it is to complete a team. The organisers also play in the competitions themselves, and don’t want to be chasing around the 1st tee reorganising, this spoils their own golf. Also even if you have booked in advance please check your tee-off time in the golf shop in advance (either visually on the board or ring the shop on 968328008). Your time may have been changed to fit you into a team. 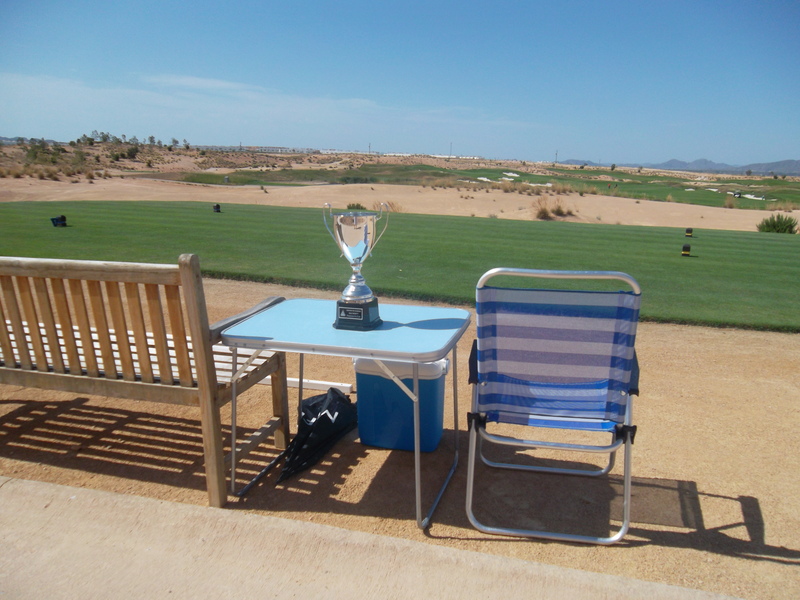 The Barry Answer Cup is to be played on Friday July 6th with free entertainment and buffet for players and partners. Cath will give out tickets to the players on the day. 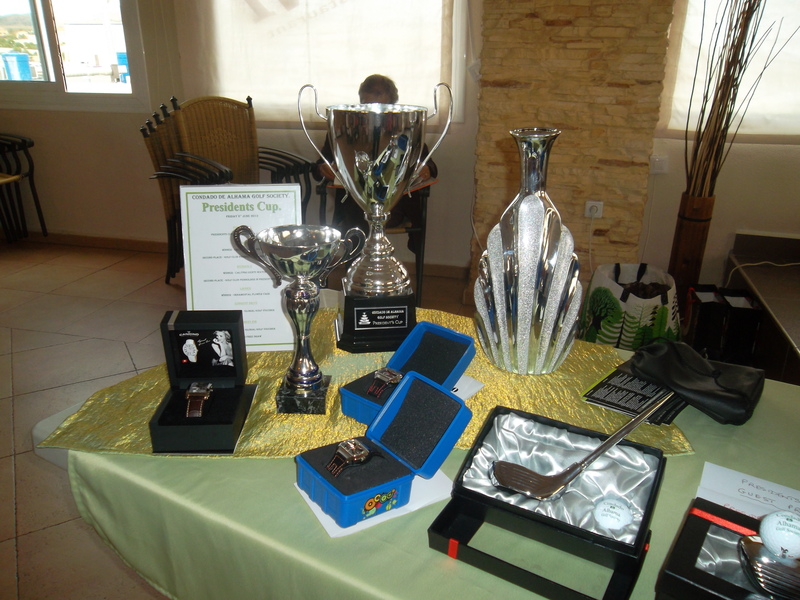 There will be lots of prizes for the golf competition. The next major is the Barry Barker Strokeplay championship and the Paul Harrington Scratch cup next month. Again a reminder to book a tee time and a place at the Amapola restaurant on Friday July 20th. For only 15 euros you get a 3 course meal with bottle of wine for 2. Entertainment will be from Christine King. Places may be limited so book your place now for al frecso dining by the pool. When I got back I checked out the clubhouse and was surprised with amount of work that had been done in the 2 days I was away. 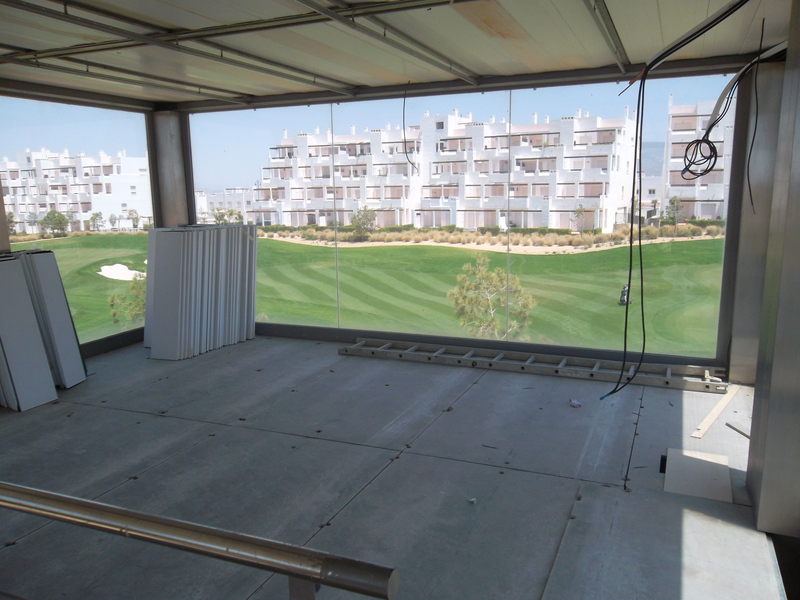 Aircon units fitted, building painted, and a definite view of were things will be. ground floor plans if anyone can understand them………………..
Carol can shout Dave when his tea is ready………………..
excellent view of the 1st and 9th fairways from upstairs……………..
the chipping green looks good from above…………. 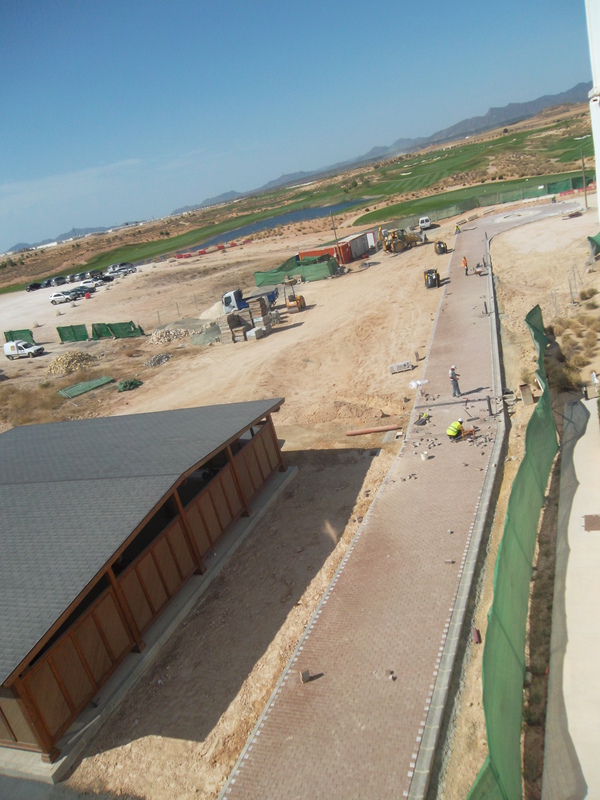 guessing shop and bar lounge to left, entrance in middle, changing rooms and toilets definitely to right…………….. I think when it is completed with plants, tables and parasols around, all the knockers may change their mind. 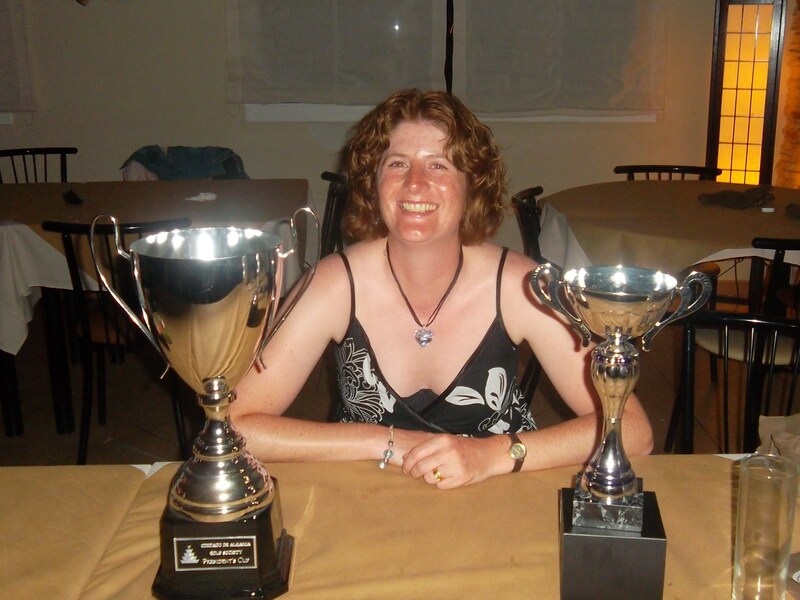 The winner of the Presidents Prize Fran Hobson with her trophies……………………………. Presidents day was played in intense heat with the 42 players needing plenty of liquid refreshment. Iced water or beer was supplied on the 12th tee and again behind the 18th green.. The competition started with an unusually early fresh breeze, which died away for a while then turned around and grew again. 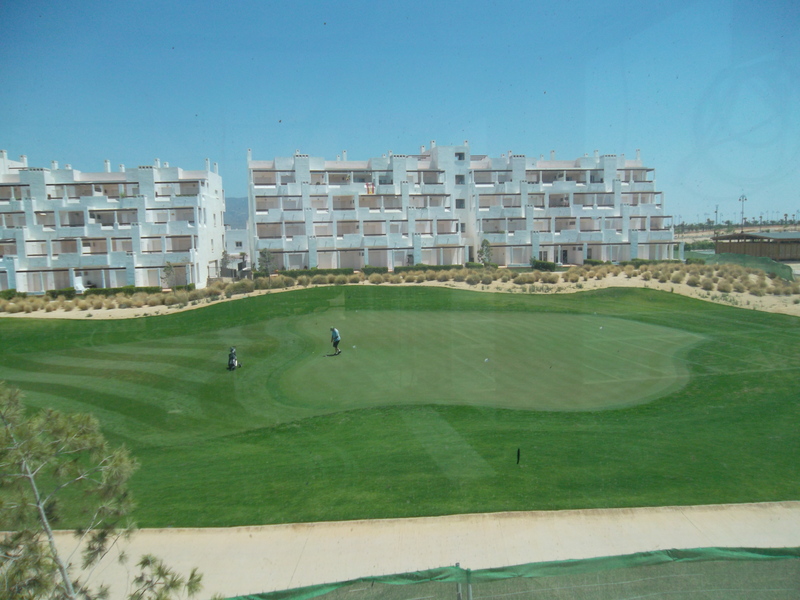 The course was in fantastic condition with the greens being a lovely pace. The conditions did affect scoring with no player reaching the 40 point mark. There were only 4 ladies in the field, but one of them, Fran Hobson, managed to outplay everyone and win the competition with 38pts. Fran proved me wrong on the day on 3 occasions. Firstly, I chose the par3 11th hole for the nearest the pin as with the tee and flag position being difficult the ladies had to cross the water to the green (usually from the front tee they can chip it onto the front edge without crossing the water). When Fran put 2 balls into the lake I thought it was not to be her day – but she persevered and came out on top. Secondly- After hitting the ladies longest drive on 18 she played a marvellous approach which hit the front of the green but unluckily ran off into the hollow at the back right. With the pin at the front right and a sharp hump to overcome I said to Graham ‘she has no chance to get it close’. Fran heard me and proceeded to prove me wrong again. From about 25 yards she hit a lovely paced putt which rolled up onto the green hugging the edge, then climbed over the hump and turned sharp right, finally just toppling into the hole for a birdie ! As she leapt in the air with delight her playing companions and the small gallery raised a roar which could be heard around the course! What a way to win an important major competition – even an unlikely par from there would not have been enough to take the title. A finish Tiger would have been proud of! My 3rd mistake was to think one of the 4 lady entries would not win – I selected as the 1st prize an expensive gents wrist watch. 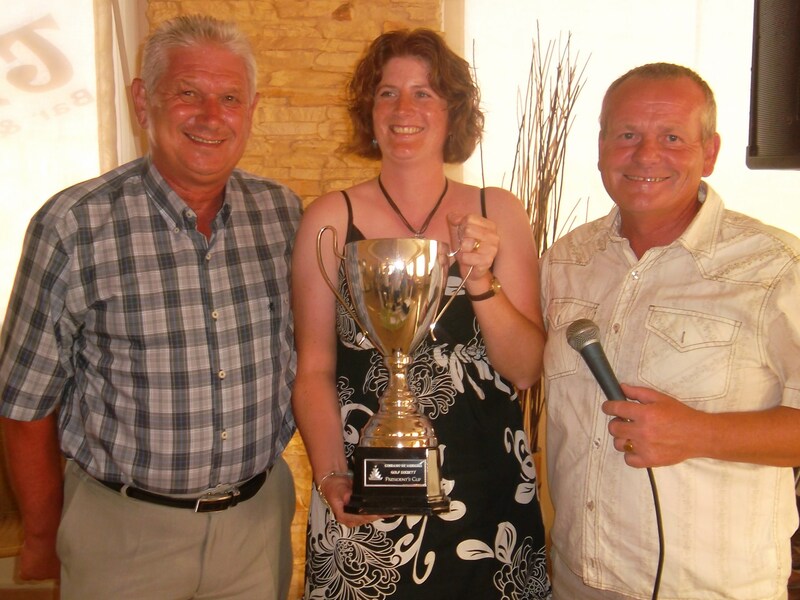 However as I presented Fran with the prize I told her she could change it – If she goes to Torrevieja beach the salesman was a black man with a goatee beard who said it was genuine and was guaranteed and to bring it back if not satisfied. Seriously though, I gave her the receipt from Time Road in Thader so she could change it if she wished. 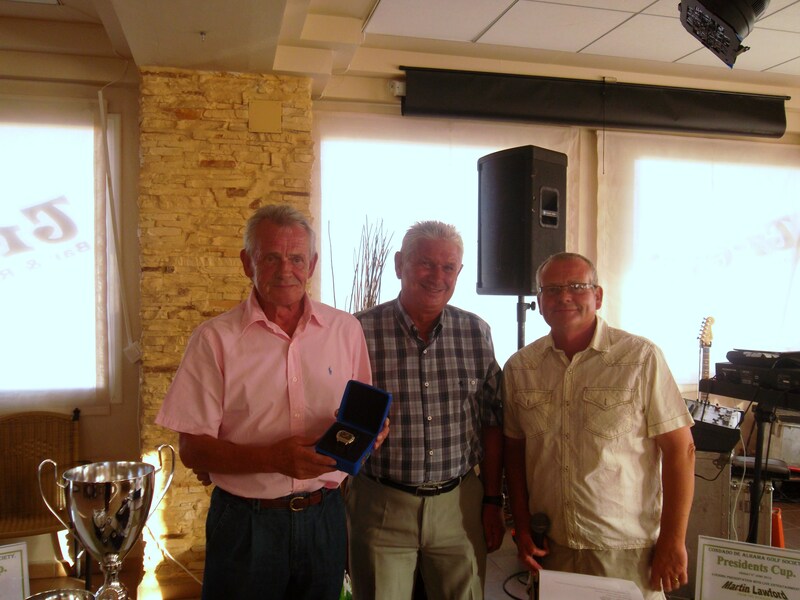 Division 2 winner Jim Alwell…………………. 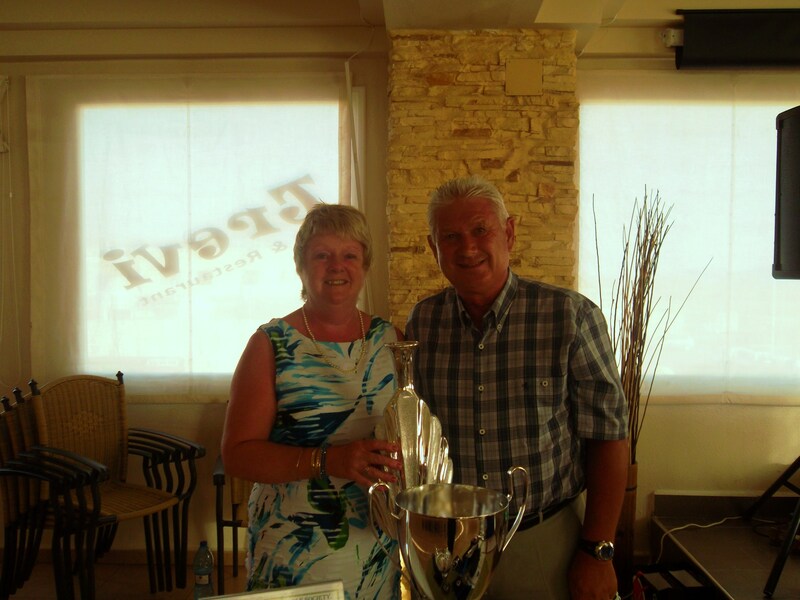 Ladies section winner Dorothy Simpson………………. Could this be the start of my stage career?…………………. At the presentation at night in Trevis bar we had a fantastic hot/cold buffet which everone agreed was the best around. Martin (from the Beagles) sang his heart out but unfortunately it was to only a few, as the failure of the aircon drove the majority outside to sit in the cooler air. The next major is the double-header on July 20th (Barry Barker Strokeplay Championship & Paul Harrington Scratch Cup). Please book your tickets early for the poolside meal, presentation and entertainment at the Amapola restaurant Bolneuvo (transport is available) as numbers will be limited. Next weeks competition is a 4 person texas scramble. 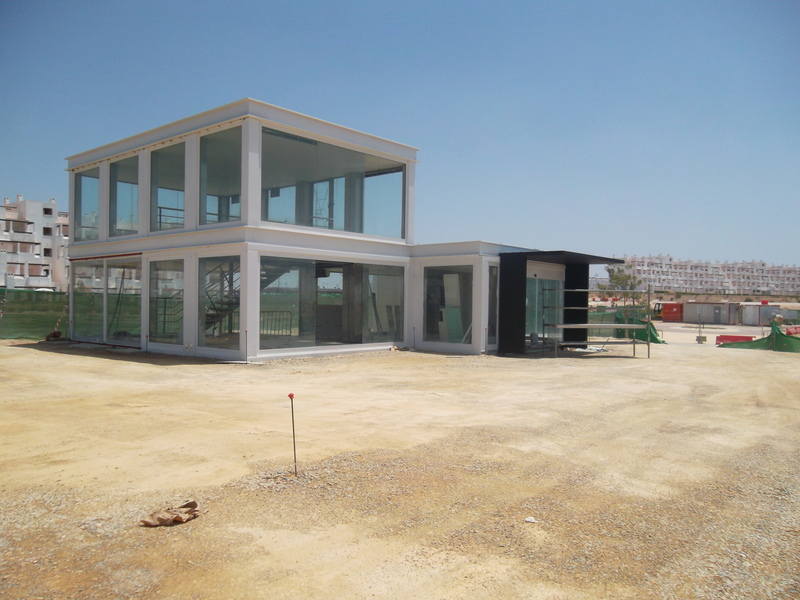 It looks as if the temporary clubhouse may open on schedule at the end of June. 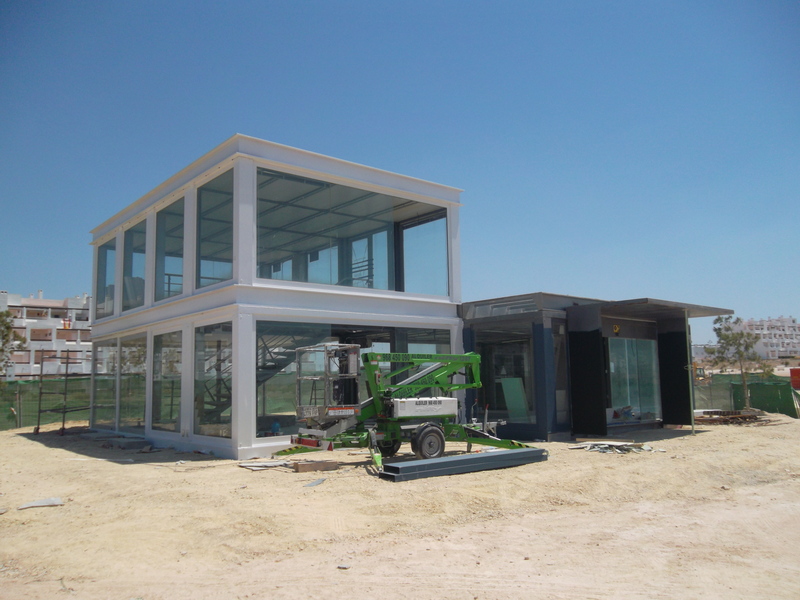 It has also been confirmed that there will NOT be a vending machine for thirsty golfers – maybe commonsense has prevailed? It will be a staffed bar for drinks and snacks. The franchisee has still to be announced from a list of about 6. This can only be good for the development of our golf course and the community. 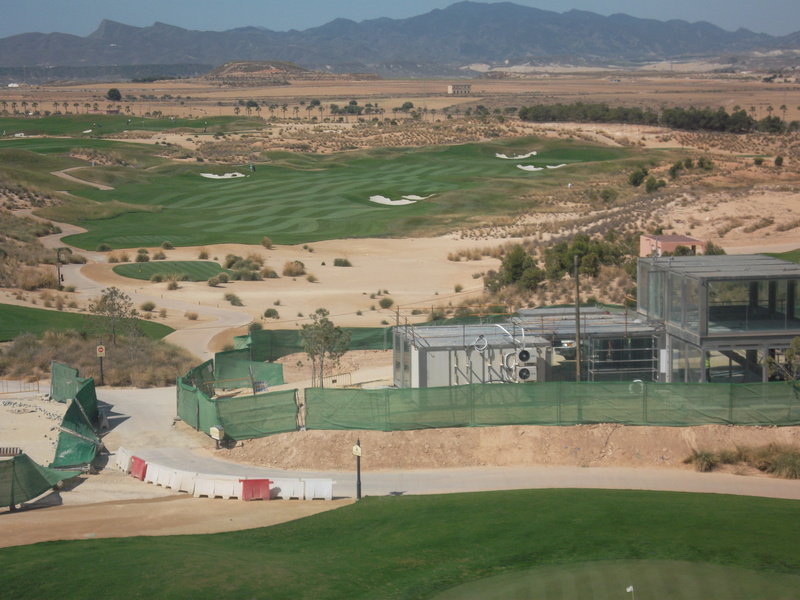 With these facilities professional tournaments must surely come back to one of the best courses in Spain. In reponse to a request for updated photos – here they are. 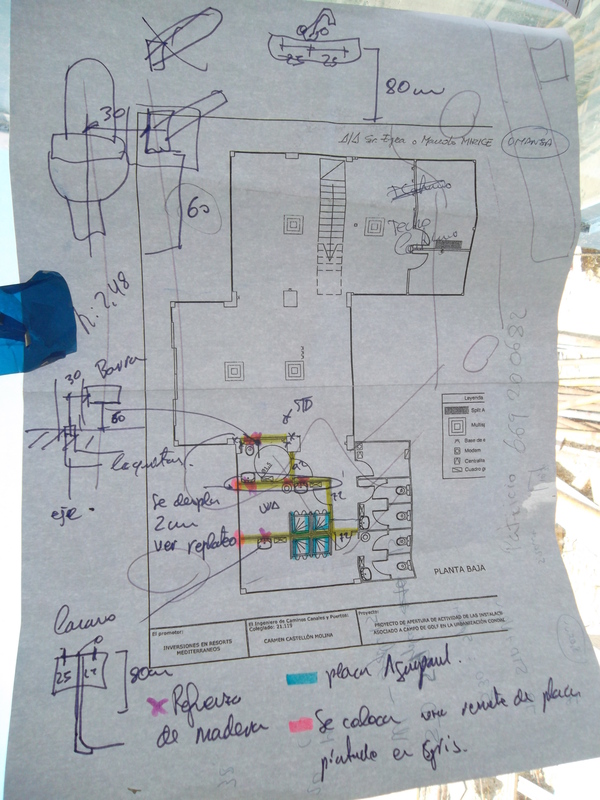 Work is progressing well and the project seems more in depth than I had imagined. 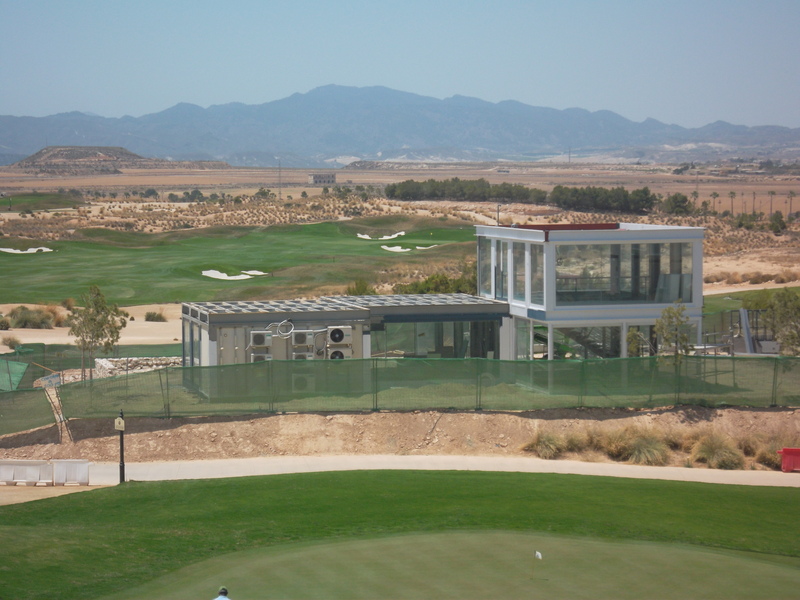 Looks like they have spent a lot to set it up so maybe it is a ‘long-term’ temporary clubhouse? 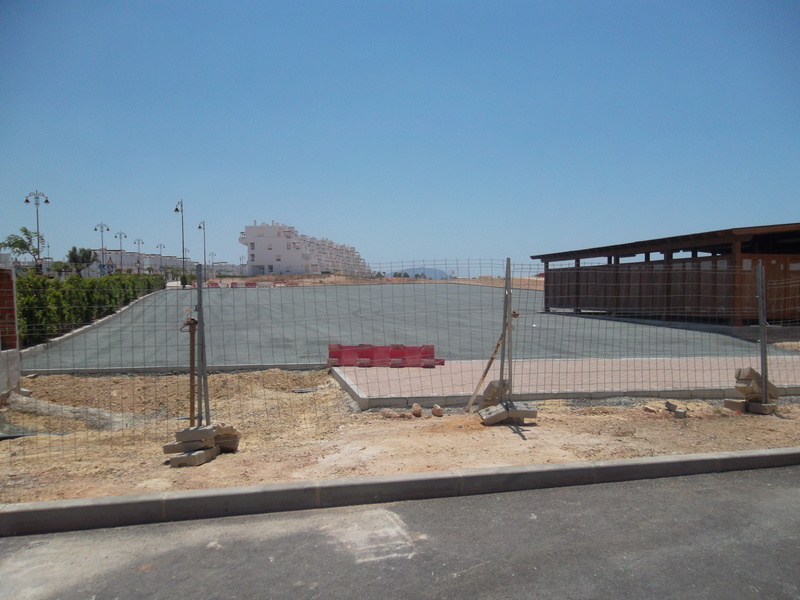 The new car park pictured above………………………. 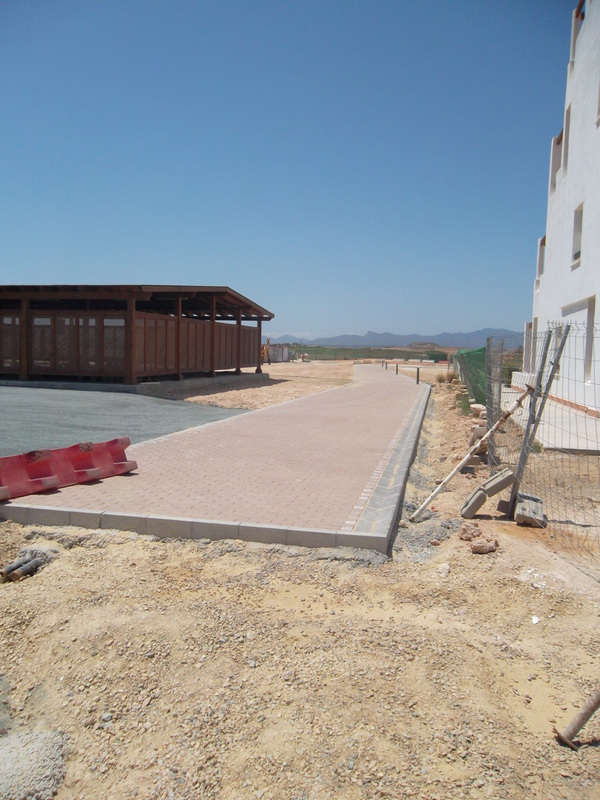 This is the buggy path block-paved at great expense………………………. 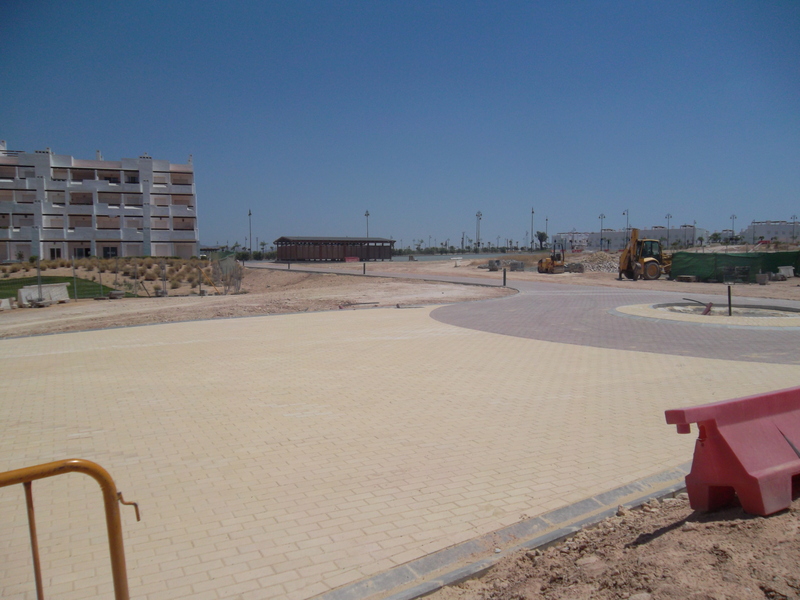 View of the buggy roundabout……………. Looks like the toilet area……………..
Will post results and pictures of Presidents day tomorrow – if I’m sober! This week was a better than expected turn out of 42 players for the modified bogey competition. There was some confusion as to whether a nett birdie or bogey was plus or minus, but that was easily sorted out. The scoring in this format was not particularly good with plus two (better than par being the best score. The course is in fantastic condition, except for the water levels in the lakes which is either low or non existent. Hundreds of balls are available aroung the 11th green for anyone willing to stand in the mud! Next week is president’s day with lots of prizes for the winners. it is an individual stableford with an overall winner and sections for division 1, division 2 and ladies. There will also be prizes for the longest drive and nearest the pin for both men & ladies. At night the presentation will be at 7.30pm at Trevis bar (Camposol). 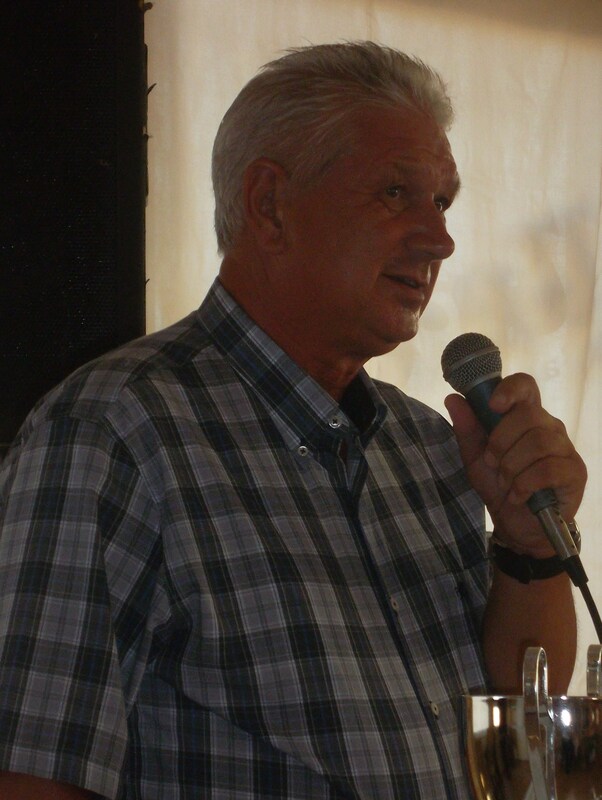 We do try to vary the venues for major presentations. 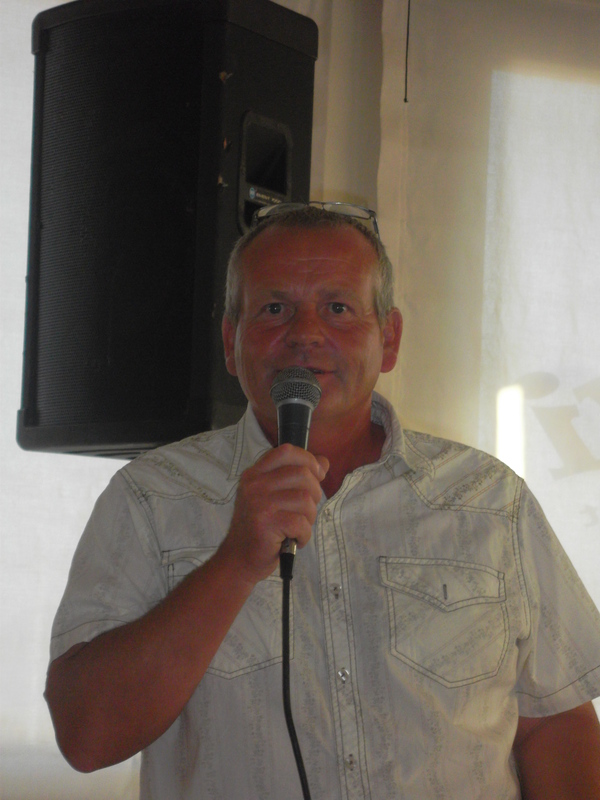 There will be a hot/cold buffet and entertainment from Martin Lawford (one half of the Beagles). This costs 12 euros per person with discounts for children. Transport can be arranged for 5 euros return. Contact me or Cath if you want to play or just have a night out. Please note the following major day (for the Barry Barker Strokeplay Championship & Paul Harrington Scratch Trophy) is now on Friday July 20th not July 13th as advertised in the diary (I need to go to the UK for a wedding on that date). 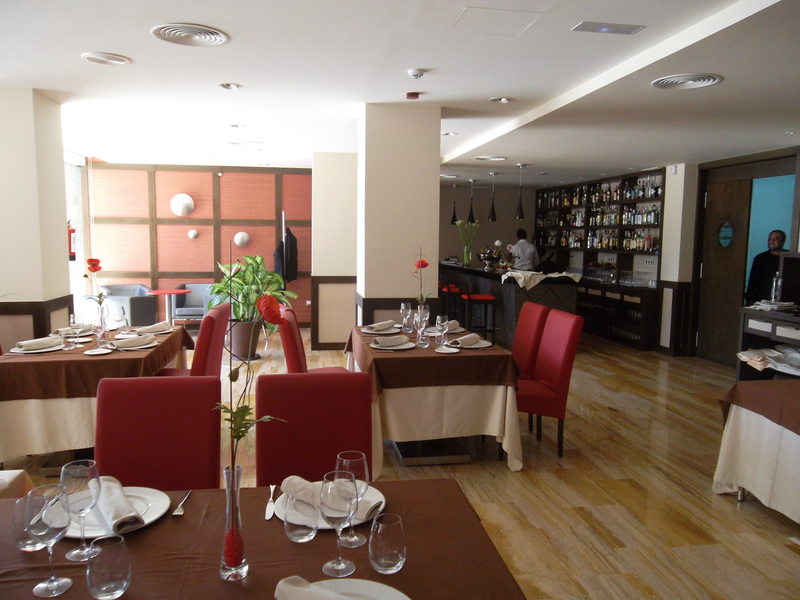 We have booked the Amapola restaurant in the Playasol hotel in Bolneuvo for the presentation party. 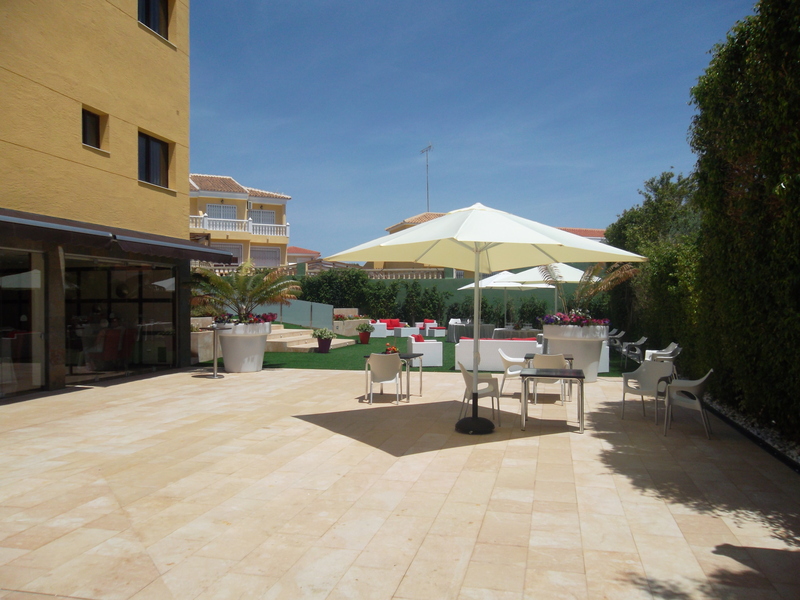 We will all be seated outside by the pool with live entertainment being provided by the hotel. It really is a spectacular venue. 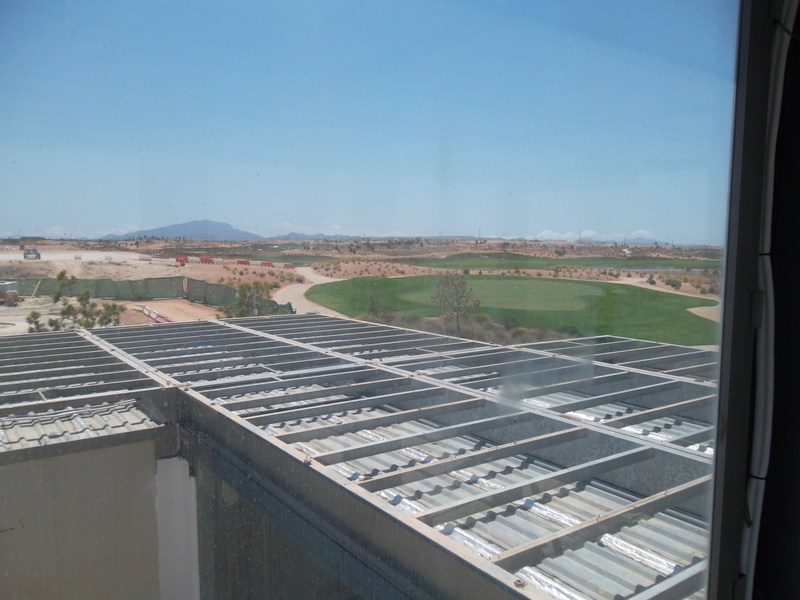 View from inside the amapola……………. 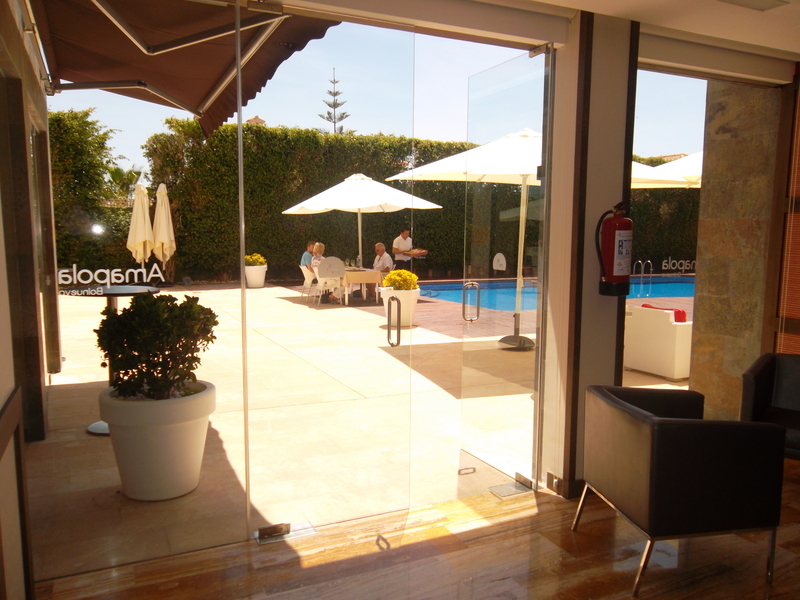 looking out from the restaurant to the pool area……………….. 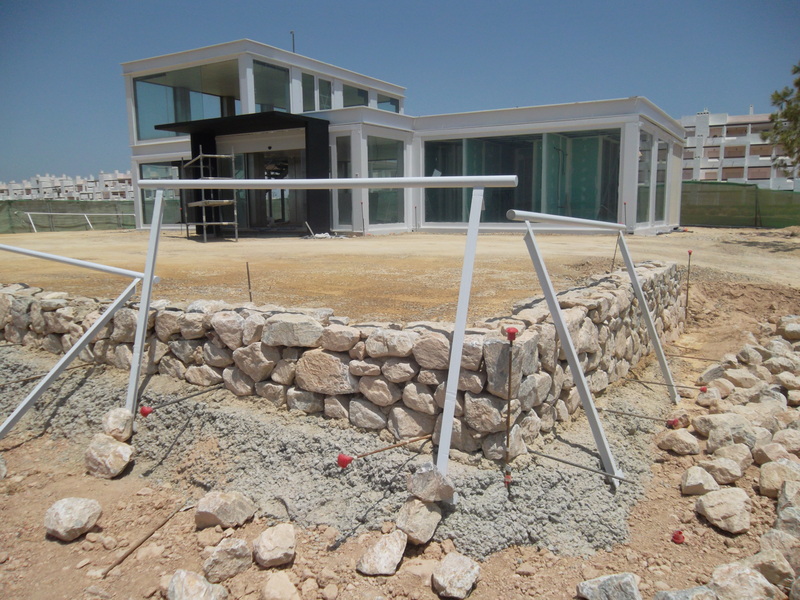 This is the view from the pool with the restaurant to the left and the artificial grassed area where we will dine alfresco in the background. The singer will be situated to the right. We are now having a monthly draw for members. This will be for 2 greenfee vouchers to be used at any of the six Global Golf courses. The winner for May was 184 and that is Jane Hutchinson. Members will have 1 month to claim the prize (not actually collect it) otherwise it will be used again. 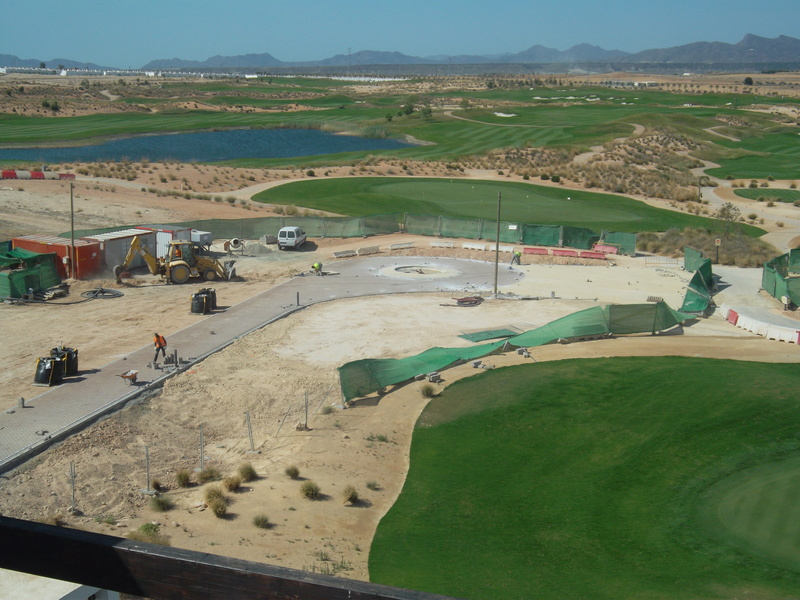 Work is continuing on the temporary clubhouse and access to it.